The Gryson is a shirt for fall days in mountain towns. 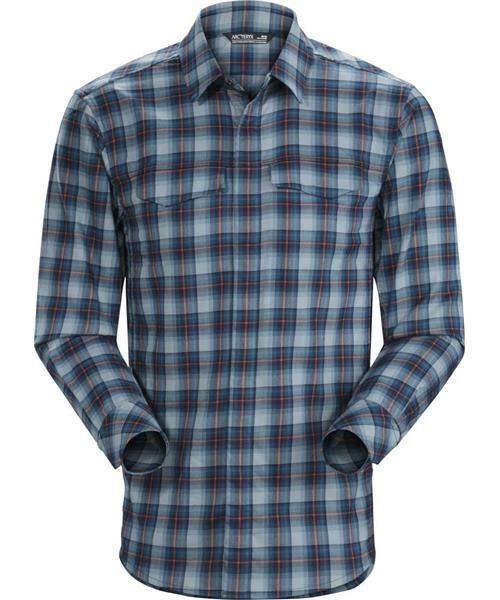 The Pulaski™ polyester flannel is brushed for warmth and softness. Two chest pockets snap closed, and the front placket has hidden snaps for a look with a modern casual style unlike the typical flannel. The comfortable Arc’teryx Regular fit, articulation in the sleeves and gussets under the arms add a level of freedom of movement appreciated while splitting rounds or cruising into town on a bike. Function and style are brought together in the Gryson’s premium materials, attention to craftsmanship, built in freedom of movement, and updated casual aesthetic. Gryson LS Shirt - Mens is rated 5.0 out of 5 by 4. Rated 5 out of 5 by toomanybikes from My new favorite flannel shirt This is one great flannel shirt, trim but not binding at all. A vest or jacket slips over it with ease. I got the Thallus colour and the yellow on the website photo is actually more of an orange but I think it looks every better. I'm 6' 2" 190 lbs and the large fits terrific. The sleeves and shirt tail are a little longer for on the bike too. Rated 5 out of 5 by Mark from Excellent Quality and Fit Really nice fit and comfort. I would recommend this to anyone looking for an extra layer or causal shirt. Rated 5 out of 5 by Bette from Nice looking shirt Bought this shirt for my husband. It is true to size. Fits really nice with a tapered fit. He really likes it. Hasn't had a chance to wear it when he rides his motorcycle so not able to give an opinion on warmth/cooling of it. Otherwise, definitely recommend it.